What’s in Your Warehouse: A Giant Bubble? April 22nd, 2014 | Wheaton World Wide Moving. Wheaton agent’s located all over the country store unique items in their warehouses. 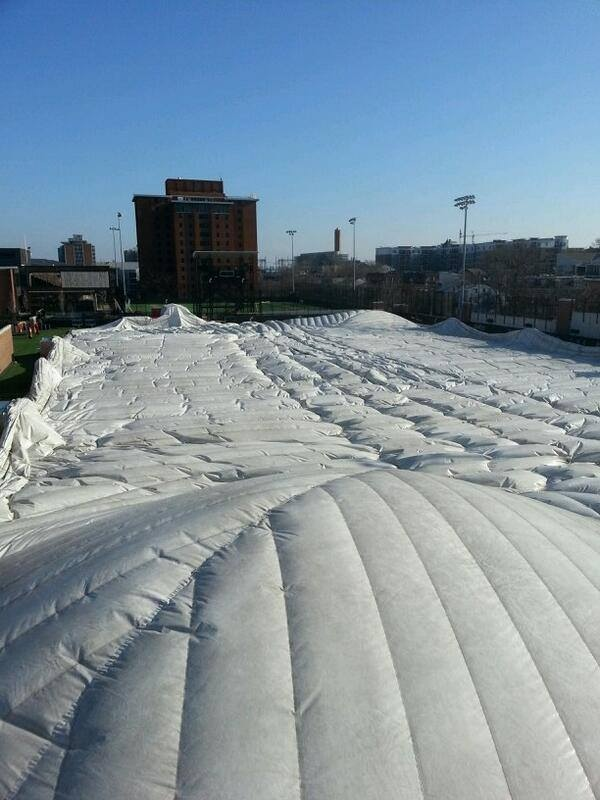 This giant practice field bubble, which belongs to the University of Cincinnati (UC), is definitely different than most household goods stored in agent’s warehouses. From running a successful play to serious coaching moments to teammates creating lasting memories it’s safe to say that this University of Cincinnati practice field bubble has seen its fare share of incredible moments. But where do you store a bubble that stands 75 feet high and stretches nearly 370 feet long? Bell Moving & Storage, located in Fairfield, Ohio, has accepted the challenge. Bell Moving & Storage has provided relocation services for the University for more than 15 years. Bell’s warehouse space, which totals nearly 15,000 square feet, is managed by owners Tamara and Bill Kissel. The Kissel’s customer-first philosophy has led the University of Cincinnati to call this Wheaton agent its official mover. What does the storage process look like? Bubble roofs grace many sports arenas and practice fields across the United States. Have you ever stopped for a minute to consider how on earth this giant bubble appeared overhead? As one would assume, it is a very involved process. Lucky for you, we caught up Tamara who gave us the inside scoop. Once rolled, it takes a combined effort of cranes and flatbeds to transport to the moving vans. From there, it’s distributed to the necessary location within the warehouse until the Bearcats take on their next season.